This month D has been very interested in pirates. We have all played pirates and D has dressed up as a pirate. I thought it was very fitting that we have also been reading Henry's Pirate Surprise a lot this month. 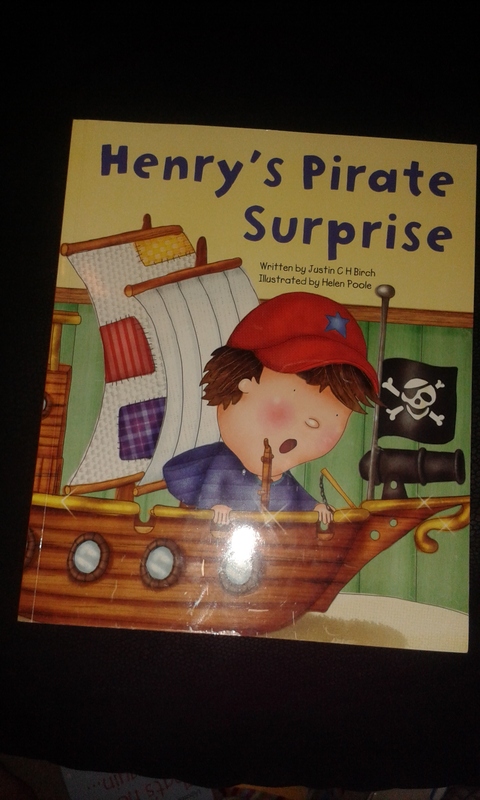 Henry's Pirate Surprise is written by Justin C H Birch and Illustrated by Helen Poole. The book is about Henry and his uncle who own a toy shop. 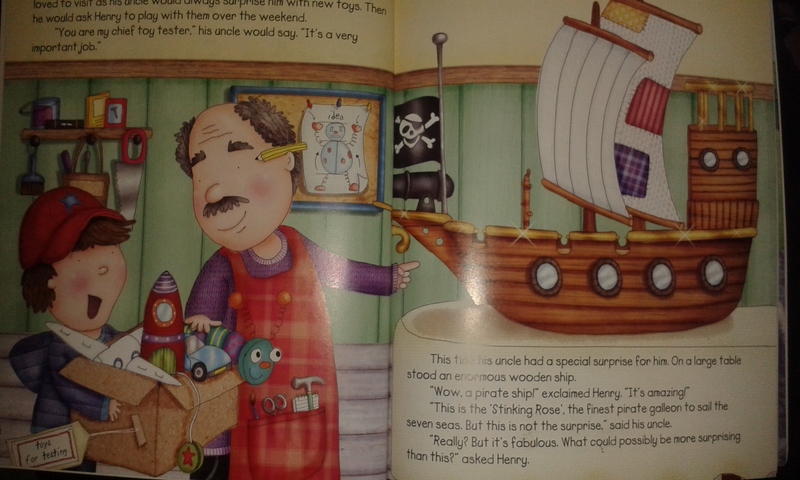 Henry's uncle has a surprise for Henry which is a wooden ship, but this is no ordinary pirate ship, it's occupant's are tiny pirates who help Henry save the day! We all love Henry's Pirate Surprise in our house. It is such a surprising story, you can't really predict what is going to happen while you are reading it. D particularly love the thumb sized pirates who live inside the ship, Each pirate has his/ her own personality and strength they use to work as a team. The book really promotes team work and using each person strength to overcome a challenge. I have not found a lot of books in which this happens so it is defiantly a nice change from one hero saving the day or helping everyone else. D particularly loves that Henry is just a normal little boy who doesn't believe that the pirates are real at first he thinks they are toy pirates, D finds this hilarious. Throughout the book Henry and the Pirates grow a lovely friendship throughout the day in the book. The book requires as much imagination as you want to use. It is not dependent on if your child can think up an adventure or if they can simply make the picture's come alive in their mind. The story ends but with the pretense that there could be another adventure with Henry's Pirate Surprise. We all made up another adventure with Henry and the Pirates, which I must admit was fun for us all. 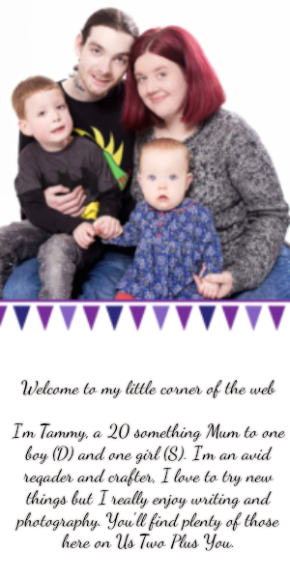 Each of us was a pirate and had to help Henry to find his way back home from a desert island, Although most of this was thought up by myself and daddy D loved playing the story out and dressing up as a pirate to do so. 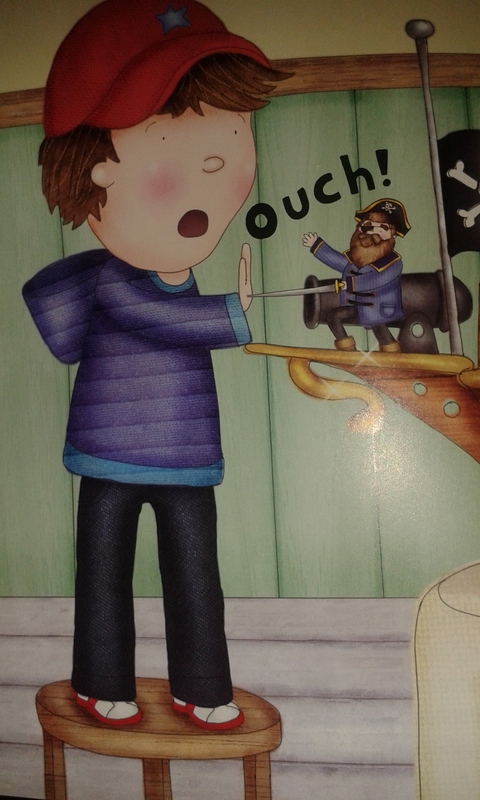 Helen Poole has done a wonderful job of filling all the pages in Henry's Pirate Surprise with beautiful, colorful pictures depicting the story. She opens up your imagination bring all the characters alive on the pages of the book.